Know the Top 5 Common Signs of Roof Leaks! We all know that a good roof protects our home from rain, heat, snow, hail, and other natural elements we experience every season. But when was the last time you had your roof checked by an Northern Virginia roofing expert? To ensure that your shingles remain in good shape to give you protection for years to come, it is essential that you do routine maintenance to detect any issue before it transforms into a major problem. Yes, even a tiny hole can cause tremendous damage if left unattended over time. 1. Damaged Flashing – Flashing—the thin metal sheet, fitting, strip, or angle that covers a seam or the transition spot in a roof—is the most vulnerable area for a leak. In newer roofs, this can be caused by incorrect installation or the poor quality of materials used. 2. Damaged or Missing Shingles – Improperly fastened shingles can easily yield to severe weather. 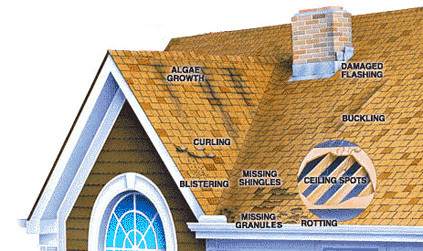 Older shingles dry or crack as a result of exposure to harsh weather conditions that cause your roof to leak. 3. Excess Granule Loss – The top surface of your shingles is applied with crushed rock coated with a ceramic coating and then fired. When this is depleted, your roof can be more susceptible to leaks. Granule loss is also an indication that your shingles have neared or have reached the end of their life. 4. Water Stains on Ceiling and Walls – If you notice bubbles forming on the walls or ceilings or mold or mildew growing on these areas, water has seeped through holes, damaged shingles, or broken flashing. 5. Higher Power Consumption – Yes, a leak in your roof can cause your electricity bill to surge because holes here and there can compromise your home’s insulation, which in turn can cause for your heating or cooling systems to work harder. Your commitment to keep your roof in top condition will give your family the comfort and safety they deserve. If your roof is showing any signs of water damage, call us at (703) 753-4585 to schedule your free in-home estimate. Our team of skilled roofing specialists can detect various roof leak issues. For more information or any other concerns regarding your roofing in Manassas, VA contact Peak Roofing Contractors today.